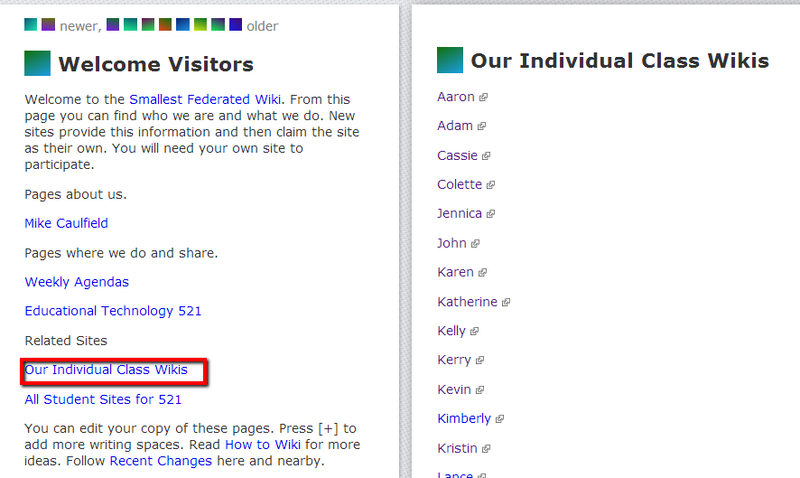 This post assumes that you’ve read some other posts on federated wiki. There’s a few dozen on this site if you have not. Click the federated wiki tag and then scroll down to see them all. 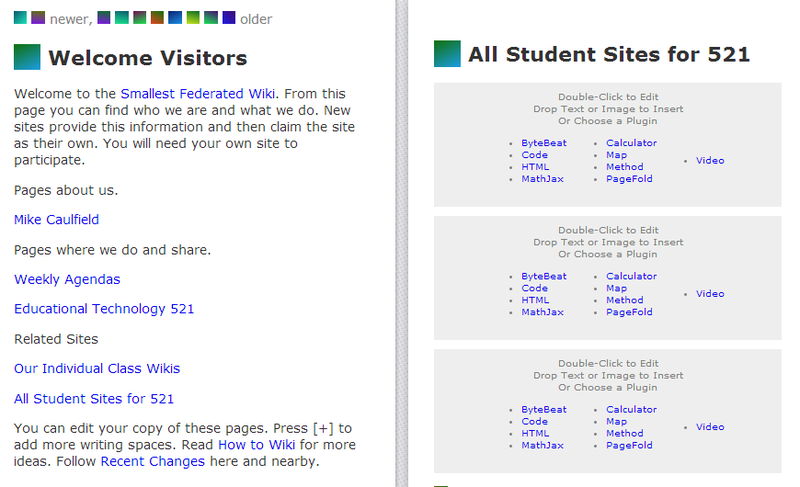 If you know what federated wiki is, the following description should get you started with federated wiki use in your classroom. Under “Pages about Us” have the student put in a name as a link. It could be their full name, their first name, a nickname. Just as long as it is recognizable to you. After adding the name as a link, they click on the link. This new page will be their bio page. At this point I show them an example bio of myself — something relatively lighthearted but substantial. Students will draft their bio pages. A lot of students will make boring bio pages at first, but here’s part of the genius of wiki — have the students look at other student bios after they are done making theirs, and generally this will help some of the students conceptualize theirs. At the end of this you’ll end up with a lot of very cool bios. IMPORTANT: After students set up their bios, it’s a good time to have them “claim” their sites with the big “Claim” button at the bottom. This uses a Mozilla-based Persona login that sets the student up as the sole editor of the site. If you forget to do this early, students will end up unintentionally editing other students sites, which isn’t the end of the world, but is a bit of a headache. Have them claim the site early. Click the link to go to the student page. Click the link to the student bio. 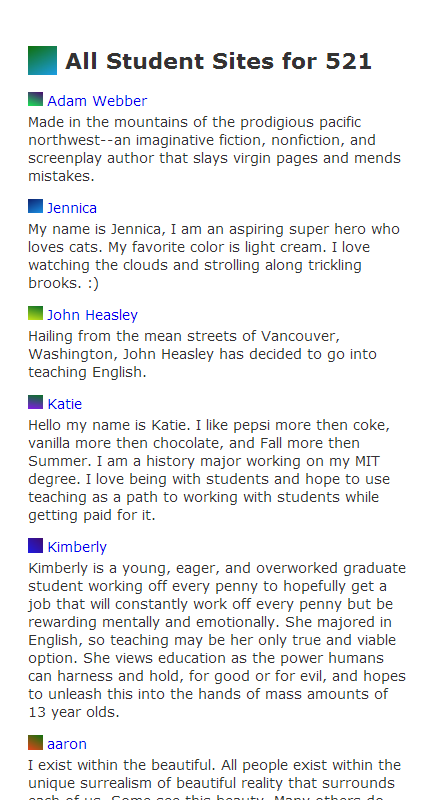 This will pull a “reference” to the student site and the first paragraph of their bio into your page. (Note: I did this with the “link launch page” described above to streamline the process and standardize site names, but you could also have student self-select site names and email you the link). I had 20 students — the process took about 10 minutes. It’s the most time-consuming part of the setup. But when you are done you should have a page that looks like this. The circle page is pretty cool, because anyone can load it and see all the class activity (to be technical: it pulls class sites into their “neighborhood”). Students can (and will) fork it back into their own sites. Unlike FeedWordPress and other “hub” designs, however, the power to make circles is given to the students as well — the students can easily create their own circle page entitled “English majors” if they want, and pull in all the references to sites by English majors in the class. They can set up circles for their group, or for the three people who always do exemplary work. 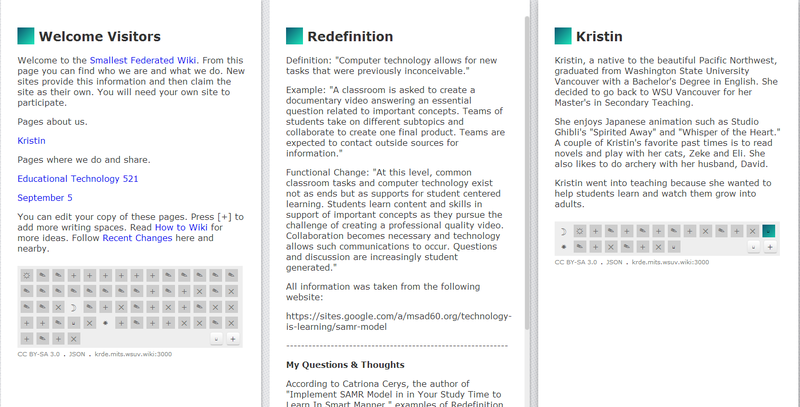 Here I’ve loaded my class circle, clicked recent changes, and am looking at a recent submission by a student on the “redefinition” aspect of SAMR. One thing to note here is how well the form supports a “notes” aesthetic — the student here writes very well, but is allowed to put half-formed thoughts up and questions up to which they can later return.. 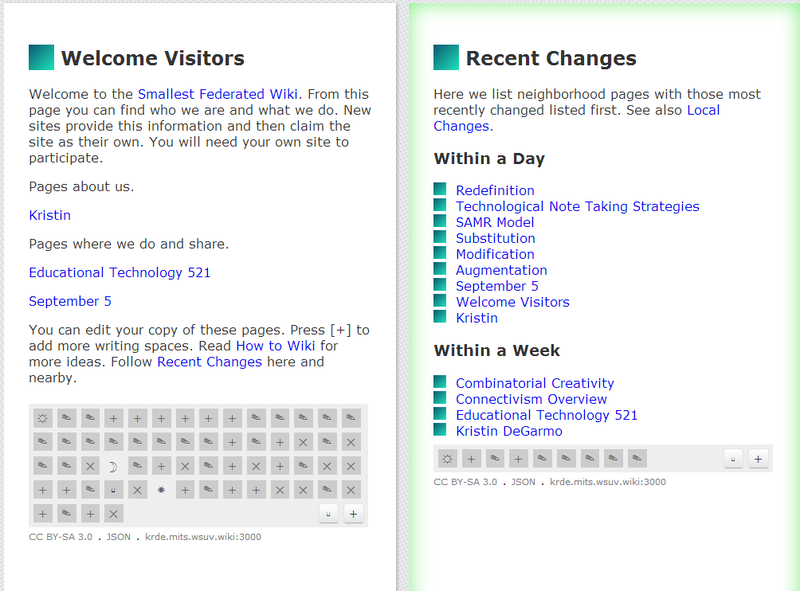 If the metaphor for the student blog is the personal journal, the metaphor for federated wiki is the researcher’s notebook. The student we are looking at right now, with the teal gradient, has been very busy, and has in fact gotten all their work for next week already done. Another student (purple gradient) has done the SAMR assignment, although maybe not the “note-taking strategies” assignment. Since I used a naming scheme (first two letters of first name and first two letters of last), I can hover over these icons and know immediately which student they represent. 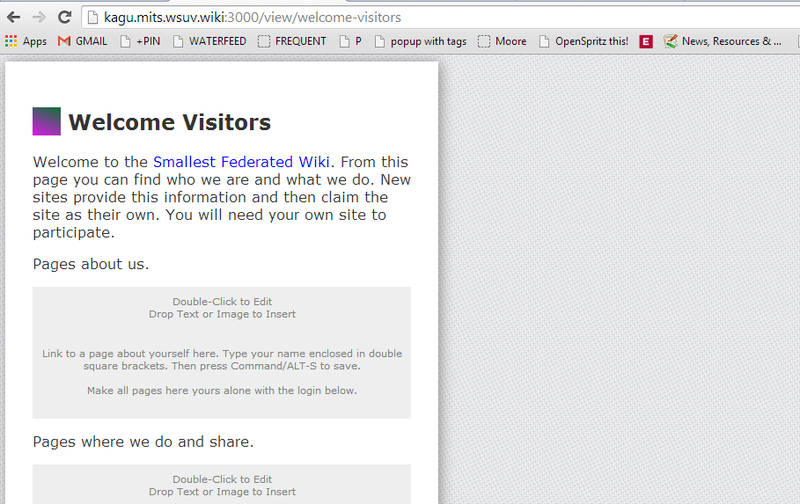 The teal icon here has a hover text of “krde.mits.wsuv.wiki”, which tells me this is Kristin D’s work. If we click on the teal icon at the top of Redefinition, we can get her Welcome Page. Another shift-click opens up her bio page as well (click replaces the page to the right of the page clicked, shift-click adds a page in the first empty spot, giving you the page in an added column — it sounds odd, but feels awesome when you get the hang of it). We can also look at just Kristin’s feed now that we’ve collapsed our “neighborhood” to just her. Reloading our class circle and going to the page on SAMR model, we can start to see how the federated aspect works in the classroom. Any student or teacher can easily use the “twins” notification up top (that part that shows links to older and newer versions) to pull up different student work on the same subject. The assignment was to find some articles on SAMR and to summarize them. 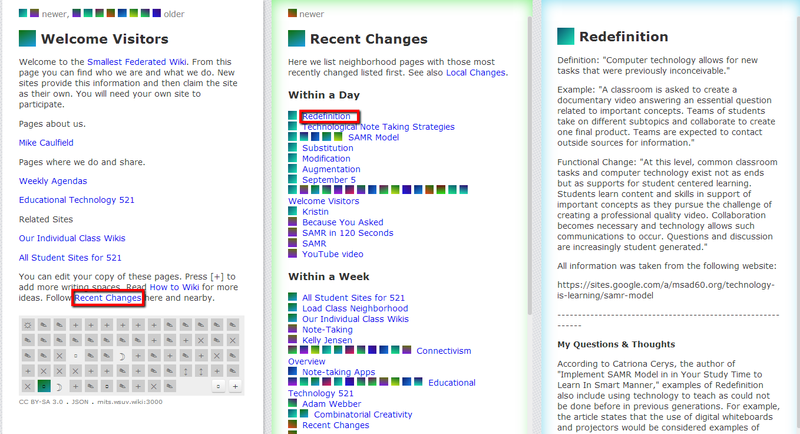 In this case, a day after class, a couple students have found the article they want to use, but not done anything yet. One of the neat things here is I can check on work in progress — see what articles they’ve selected and the like. For the students, one of the neat things is that by seeing other student work in progress, they have some idea of what the target they are trying to hit might be. That’s enough to get you started. We did more in class than this, but I’ll write up the next part later. I found the process to be pretty smooth by edtech standards. Certainly orchestrating mass registration in a class always has a bit of a herding cats element to it, but this process actually compared favorably with something like signing up for Google Sites or setting up a blog. That said, there were a few issues I’d make more effort to plan around. As I mentioned, you should be very insistent that students claim their sites early on. 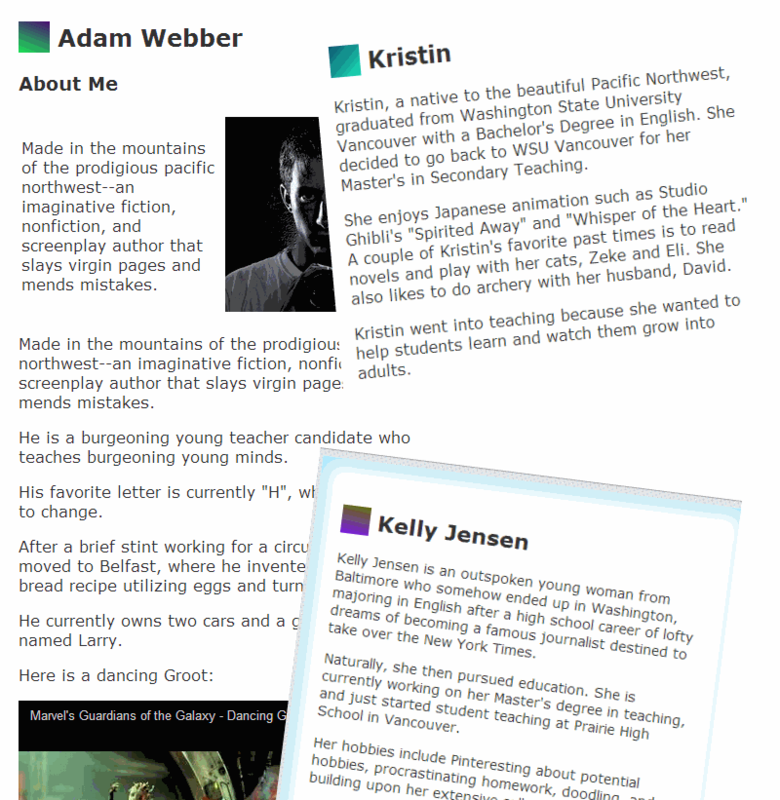 We did have one issue where a student looking at other student bios ended up claiming someone else’s site inadvertently, which was a bit of a mess to sort out. Before the students start to wander off their newly created site, have them claim it. I found it a tad difficult to create the Class Circle while simultaneously assisting students in setting up their bio pages. I think what I would do in retrospect is have them set up bio pages, claim them, surf other bio pages, edit their own pages again — then I’d call a break. I could probably get the circle page made in about five minutes while the students go get a soda. When they came back, we’d continue. I’m not sure how this happened, but a couple students logged themselves out and started getting “yellow-border” pages, indicating their changes were not being saved to the server. Additionally, in the flurry of 18 people hitting the AWS micro instance at once it may be that one or two of the edits did not post because of that (note: this is only speculation). In any case, I think I would have started off explaining blue and yellow borders to students, and showing them what to do if they got a yellow (check to make sure you’re logged in, then fork the page to the server to save your offline edits). The biggest surprise is that no one really had trouble wrapping their head around the tool. It was no harder for students to understand than blogging or social bookmarking. We even did an activity where students forked a page with a George Siemens video on it, took notes on the video, checked the notes other students had written through using the “twins” links, collaborated with students in their group on a page, then did a cross-tab drag and drop to fork the resulting video summary to their site. One or two students out of the class didn’t quite make it, but the vast majority of the class did this easily. (If Warhol did George, it’d have looked like this). This might all fall apart as we get deeper into the tool — here they are just executing actions without really understanding the underlying interaction model. So I don’t want to celebrate too much yet. But it may be that federated wiki is easier for people who have no extant understanding of feed-based blogging communities or standard wikis since we don’t have to unseat any exisitng ideas of how the web is supposed to work. Then again, it could just be I got lucky — this was a heavily guided activity, and the question is whether they can do it without the guidance. We’ll find out next week. Congrats Mike, you are now really cooking with this, and it keeps getting more clear how to use SFW (plus you have real world examples now to point to). Thanks for keeping the energy on this. I need to catch up on what “farm mode” is. I shall refrain from my usual icon whine. Thanks — it feels nice to be rolling forward. It’s a really small class too — one credit, and about half of it is spoken for by external standards. Could be a blessing and could be a curse. But over before we know it ;). George does have some nice 10-and-2 positioning on the wheel there. That’s to show that connectivism is fast but also responsible. subject matter, it may not be a taboo subject but typically people do not talk about such issues.